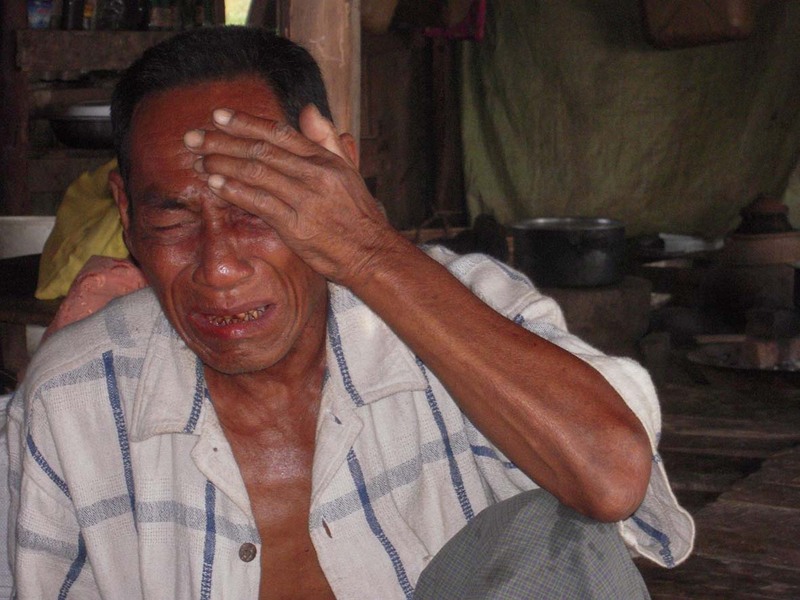 It will soon be two years since the cyclone Nargis hit Myanmar. In the villages that are suffering from its aftermath, the local people are helping each other to restore their pre-Nargis condition. In the village where we are working, with the town leader as the center of our work, we have restored vivacity in people who carry diseases or have lost their families. I would like to tell a story of what happened when JEN’s staff went surveying the village. A staff’s sandal all of a sudden broke while he was walking on a road, so he had to walk in a wobbly sandal. The local people who saw that, then, would offer their own sandals, one after another. Despite our refusals, they wouldn’t take them back. These people are equipped with such a cooperating spirit. Nobody indulges in his or her own self-interest. It must be this kindness that had allowed the town to revive. Although the town has not fully restored its pre-disaster state, we believe that they will continue to exude their marvelous sense of unity that had been fortified by the cyclone experience. This week is Thingyan, Myanmar’s New Year’s, the most important celebration of the year. Although Sri Lanka starts their New Year’s around the same time as Myanmar, Myanmar spends longer holidays that span almost two weeks. The highlight of the New Year’s is the four-day long water-spraying festival. People start preparing for the water festival from end of March. As we near the festival season, we see more and more advertisements that reflect the spirit of the festival and more stages for water-spraying in various places of Yangon. During these four days, since almost all the shops are closed, people of Myanmar and foreigners together go out shopping before the water festival. Because they’re on breaks from their work, many foreigners also travel outside Myanmar. From 1-2 weeks before the water festival, everyone gradually started to get excited, and there were more happy faces in the streets than usual. 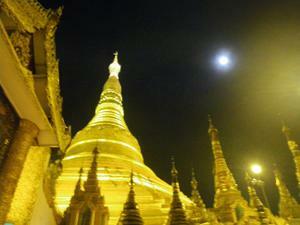 Just like the New Year’s for the people in Myanmar, there would always be enjoyable times anywhere in the world. And I believe anyone is capable of having a great time during then. We wish for people’s happiness to last. Happy New Year and Happy Thingyan! 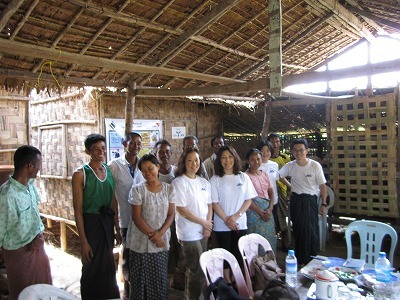 Last week, we visited Myanmar and monitored the work there with Ms. Kazuyo Katsuma, a Chabo! Member and an economist. To monitor the work means to assess the work fairly. More specifically, it is to encounter many different kinds of work and people, grasp the big picture of the work, and review the effects and successes of JEN’s work as a whole. 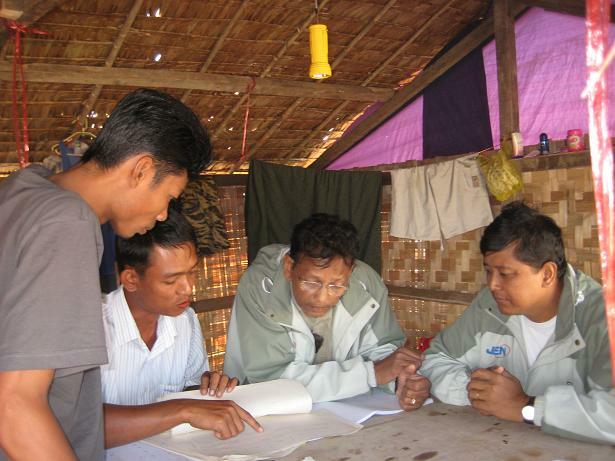 To the local staff, supporter’s monitoring is an extremely great opportunity to show their work. They can also remind themselves that there are people who support and look over their work. 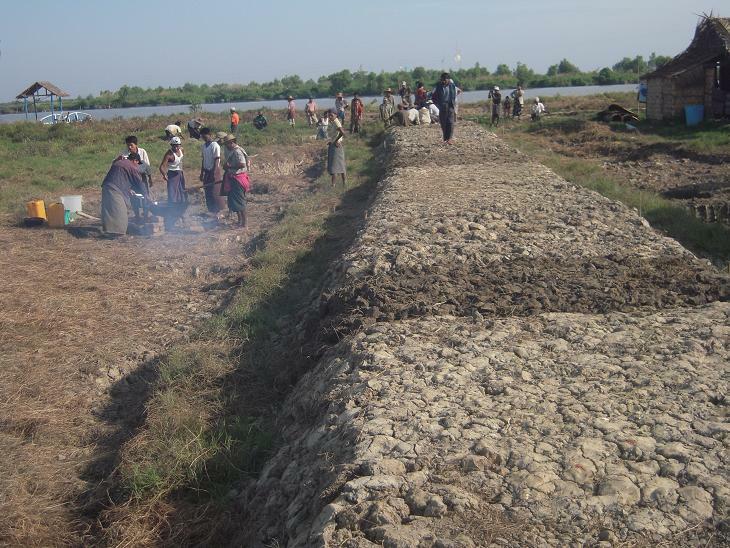 We really would like to continue working hard to do better work for the Myanmar people. 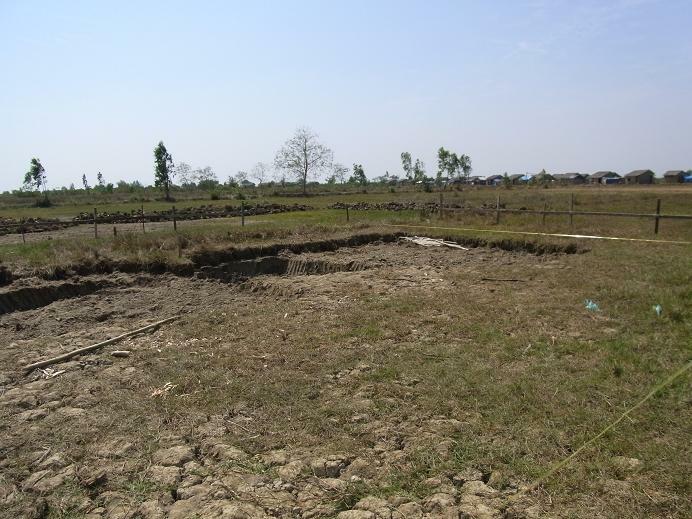 Although Myanmar is currently in dry season and doesn’t see even a drop of rain, water keeps springing as we dig further and further in the ground. If we draw the water out with a pump, water would spring out again before we even notice. 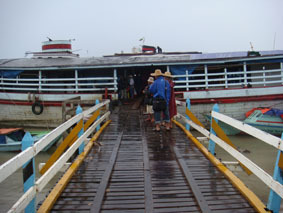 Also during transportation of construction materials, their arrival can sometimes be delayed due to the tide of water. JEN’s engineer gives instructions so that we can simultaneously work on different tasks and thereby smoothly carry out the construction procedure. 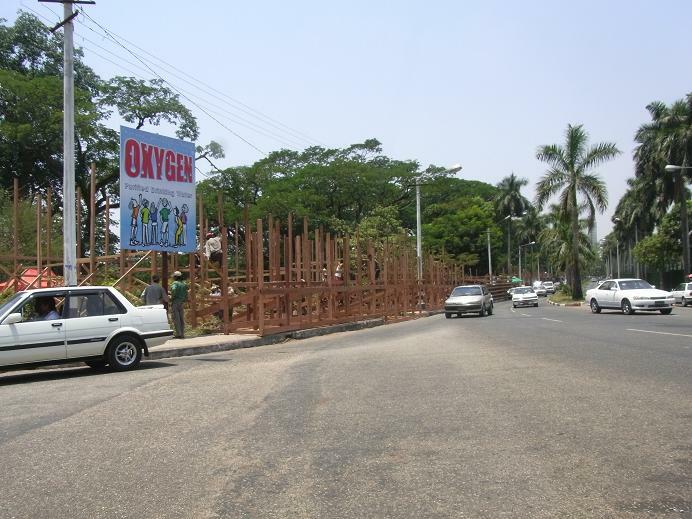 During the dry season, however, the temperature rises up to 40 degree Celsius during the day that it is too hot to carry out the project the in way we would like to. The rainy season starts sometime in May or June, so we must finish the groundwork by then. Adjustments made according to the engineer’s opinions become very crucial here. Water, therefore, is both precious and troublesome in the Burmese delta area. Our cyclone shelter-type elementary school project is proceeded by cooperation of JEN’s engineer and the construction company. JEN’s engineer is 53 years old. He has supervised many different sites up to now. During the initial stage of construction, the construction company staff were a bit overwhelmed by our engineer’s many orders, but gradually they seem to have come to understand his orders. They understood that by following close to his advices, the progress of the construction advances smoothly, and this has allowed for a building trust relationship. The site is a swampland area close to sea, so if we dig even just a meter in, water would spring out. In order to establish a firm groundwork, we would have to dig about two meters in the ground while pumping out the water. Because of this, water pump maintenance is also an important task, and if not done properly beforehand, it would prolong our construction period. 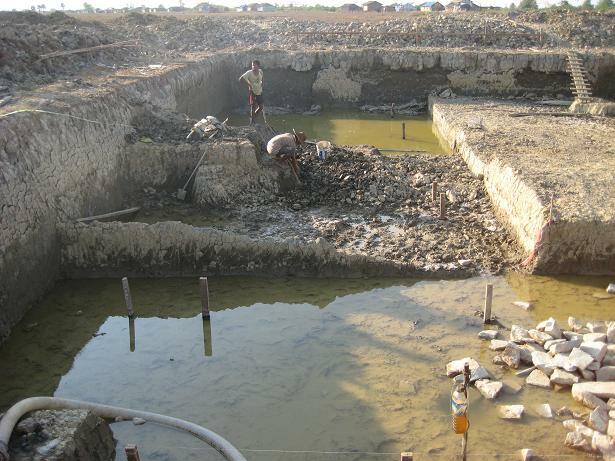 Furthermore, in order to raise our overall efficiency, while we do our excavation work, we simultaneously prepare metal reinforcing rods for the foundation and check detailed upcoming construction plans. Our work goes more smoothly by having daily meetings and instructions beforehand. Little by little, we’re in the process of creating teamwork with the construction company. We would like to continue cooperating with them until we’re able to work as a team to the end. We are currently transporting the materials to be used on the groundwork and doing a two-meter excavation work with the local people, after signing the contract with the construction company to build a cyclone shelter-type school. This project has been made possible by all the supporters in Japan and the will of late Ms. Kiyohara. We’ve initiated both projects in Gwe Chaung Gyi and Tha Yaw Chaung at about the same time, but there is some gap between their work progresses. There are many reasons for such discrepancy, but the biggest factor seems to be each community’s distinct work ethics. Even with preparing the documents for school registration, Tha Yaw Chaung lags behind Gweng Chaung Gyi, and similarly with the actual construction. Tha Yaw Chaung locals, nonetheless, start working harder when we show them the pictures of progress the other town has been making. With the right stimulus, their pride converts to competitiveness. JEN will continue to work while encouraging the local people and maintaining a tripodal cooperation scheme between JEN, the people, and the construction company, all in order to start the school construction before the rainy season. An earth-sanctifying ceremony was held on January 19th and 21st at the Tha Yaw Chaung and Gwe Chaung Gyi villages where we’re building cyclone shelter-type elementary schools. The ceremony seems to have similar significance as in Japan, in which they sanctify the earth’s soul and cleanse it. The starting times and equipments seem to vary by place and calendar they follow. A group of five monks conduct prayers, first centered on the construction site, then at the four corners. Then they drive in a wooden stake at the corner of the building that is propitiously located according to the local fortune telling. The Sunday-born people hold the edge of the string, the Monday-born’s the opposite end, and the Tuesday-born’s drive in the wooden stake. After that, the local people and JEN’s staff donate stoles and food to the monks. We then end the ceremony with a water-splashing ceremony, which signifies the sharing of the virtue among all people in the world, live or dead. JEN plans to continue our work while embracing the region’s customs and traditions together with the local people. At JEN’s disaster prevention workshop, we do not imposingly teach knowledge on disaster prevention or evacuation training. Of course, JEN’s facilitators provide an opportunity for people to to get thinking, but from then on, it is up to the people to adjust it to their own lifestyle and customs. When we have the local people actively participate in the workshops, they sometimes come up with various ideas and traditional wisdom. To this end, the workshop has to be both serious and enjoyable, with some unifying elements. We try to create a team, by playing games that incorporate everyone, having friendly conversations, and doing a lot of group work. It’s not really about teaching something for them to study, but having them come up with their original disaster prevention manual by themselves. We believe that people who have been affected by the cyclone would feel more optimistic when they feel more unified as a village, however incrementally, through our disaster prevention workshop. 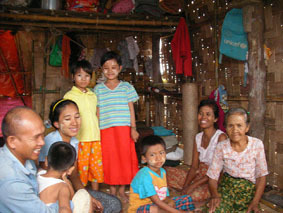 While it’s been a year and a half since the cyclone strike, we hope for your continued support on our Myanmar project. Thanks to the late Ms. Miyako Kiyohara’s will and cooperation from the Japanese government, we’re conducting a disaster prevention workshop in Phapon, Bogale. It’s been a year and a half since the cyclone Nargis hit this country. There is a possibility that an equally large-scale cyclone would strike here again and produce similar disasters. We realize that the people who inhabit our project sites are also abundantly aware of this and feel apprehensive about such risk. Because of this, it seems, the attendance rate at JEN’s disaster prevention workshop continues to make an extremely high mark of over 80%. Our staff is also alerted by this and works harder to respond to people’s interests in and attitudes toward disaster prevention. Besides JEN’s project sites, however, there aren’t that many villages that are properly equipped and prepared for the next cyclone strike. People who have gone through Nargis understandably seem to feel anxious about such tragedy, which anyone could experience for the second time. However, they are probably at a loss for directions on where to start. The disaster prevention committee that JEN established at our project sites works hard to have the local people share their know-how’s on disaster prevention with their neighboring villages. Through JEN’s project, we aim to have people in other regions to realize that tragedies can be prevented, and to disseminate the know-how’s on disaster prevention as swiftly as possible. To the local people, JEN’s staffs who are staying in their town are foreigners. It is therefore extremely important for us to establish a trusting relationship with them as soon as we can to carry out our project. The level of local participation and cooperation would also change according to the trust between us. In order to get closer with the locals, JEN staffs try to deepen our understanding of each other, by creating more opportunities to speak to them outside the workshop and by visiting their families one-on-one. The other day, a road was constructed for JEN’s cyclone shelter-type elementary school in the Tha Yaw Chaung village. JEN staffs who were at the site also took part in paving the road with the local people. Despite the labor-intensive work, even our female staff didn’t fail to keep up. By having JEN staffs participate, our feelings are able to converge, even while doing such trivial, daily community activities. The local people treated us to a snack during break when we tried to treat them. In this entry, I’d like to talk about the disaster prevention workshop, which has been made possible with the help of late Ms. Kiyohara Miyako and assistance from the Japanese government. 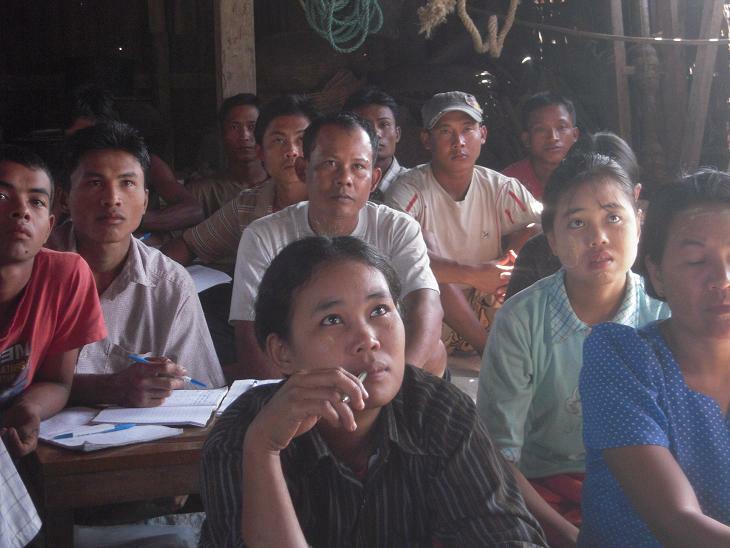 JEN runs a four-day workshop on disaster prevention with the local people. On the first day, people learn about natural disasters, their entailed damages, and evacuation protocols. Since most people have not heard of the word “disaster prevention” or “disasters mitigation,” JEN teaches basic knowledge on these subjects. The next day, we look back on our cyclone experience. We let the people recollect their memories from the outbreak of cyclone to their life as refugees. This way, people are able to evaluate how to prepare themselves for natural disasters, problems that they had, what has helped them, and think about measures they can take for the future. On the third day, we make a hazard map (a map that outlines the dangerous and safe areas) and a calendar that notes the town’s events. For the hazard map, we divide into several groups, walk around the village, investigate dangerous and safe regions, note them on a map, and give presentations on our findings. On the final day, we look back on the town’s history and discuss what we could prepare for the next time. We play a messaging game, through which we learn how difficult it is to convey accurate information to others. Upon completion of the four-day workshop, people are trained on evacuation protocols. This will convert knowledge to experience. Participants would retain their knowledge better when they actually get to try it out. Furthermore, we go over the plan to hold regular evacuation training with the people. Finally, we make a handbook that compiles what people have learned, realized, or determined after the workshop. By distributing a copy for each house, we can give local families a chance to think about disaster prevention and avoid forgetting about their cyclone experience. We don’t make and distribute handbooks in an imposing manner, but try to make them for the people and by the people. 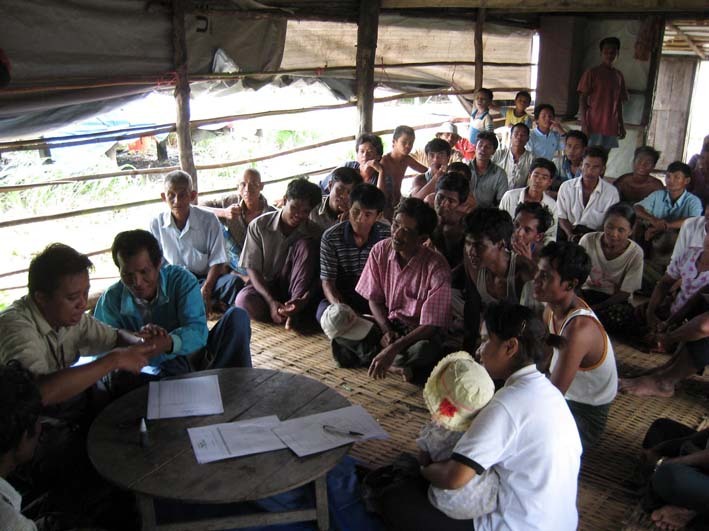 This is the disaster prevention workshop that JEN conducts for the local people. 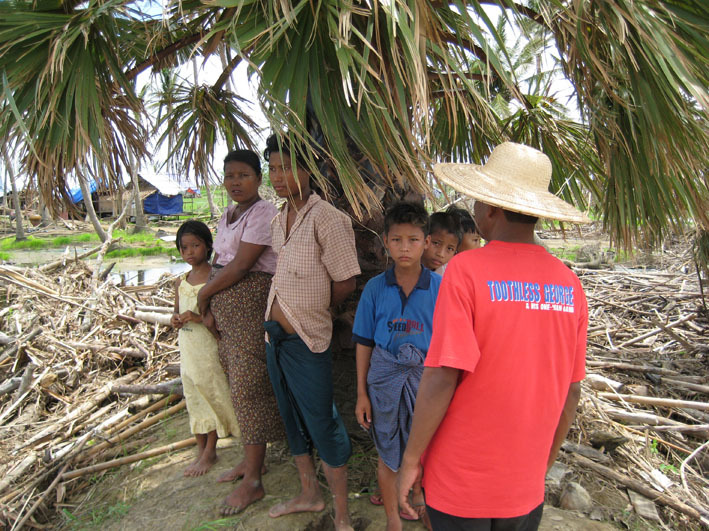 I came to Myanmar as a program officer to help people suffering from the damage of the Cyclone. However, after a while, I realized that I was the one who have been actually helped by the people of Myanmar. There is a villager who is continuously caring for us since last June. In the beginning, I was quite suspicious about his kindness. I was thinking that there must be something hidden behind his kindness. Now more than a year has passed since then; however, even now, he always gives us his hand to JEN when JEN is faced with difficulties. He never gains; rather his is sacrificing both his time and money for us. Thus, I came to realize that in this world, there exists a person with absolutely no greed who can truly devote himself for others. Now I feel shameful and regret that I had been so suspicious about his kindness. I could never thank him enough. Needless to say, it is not only him that offers such selfless kindness. JEN’s activity is supported by kindness of many local villagers. Since JEN owes so much to locals, it is difficult to pay back everything JEN owes, but JEN will try our best to pay back as much as we can for the people of Myanmar. There was a pleasant surprise at the Gwe Chaung Gyi town where we were preparing the shelter-type school construction. Last week, an engineer staff at JEN visited the planned construction site and complained to the local people, saying that the construction company might include additional cost for road construction in the bill since there is no road on which they could haul construction materials. Then a week later I visited the town, and somehow we now have a road! 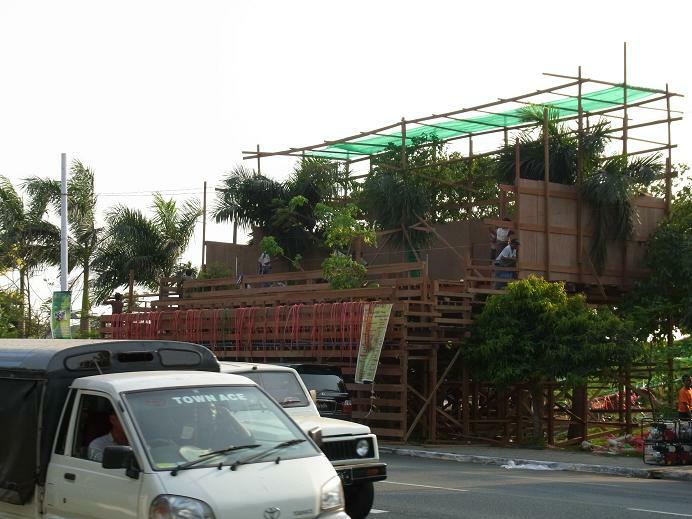 While it’s not yet complete, it seems like the local people built it by themselves. It was a very happy moment for all of us who have been working hard to empower these local people to become more self-reliant and independent. We are now almost done obtaining a clearance from the Myanmar Ministry of Education to have our school officially registered. It was a day when we all were starting to get excited at the near prospect of having the town people visit the shelter-type school. On the 3rd October, the Japanese enjoy the ‘harvest moon’, but in Myanmar, they call this annual event Dadenjyo-Rabi (Full moon in October) — a Buddhist festival to celebrate the beautiful October full moon. 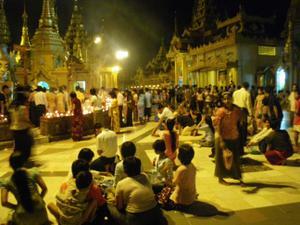 This picture shows preople visiting Shedagon Pagoda (Buddhist stupa in Myanmar-syte) on the night of Dadenjyo-Rabi. The event saw an unusually high turn out to visit the pagoda. The third of October is also the day to show appreciation to elders and people to whom he or she is indebted. Children visit their grandfathers and grandmothers and express their love and appreciation,and offer them gifts. Children become very excited because they can expect presents from them in return. Everybody at the event was very cheerful, and there was a definite atmosphere of happiness and tranquility.. Several disasters have occurred in various locations in Asia within the last two weeks, and JEN is doing all it can to return those who have been displaced, back to their homes. 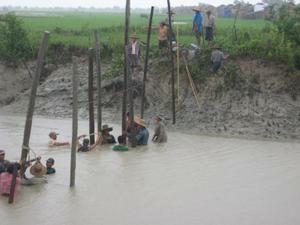 Myanmar is now facing the end of rainy season, and will enter the dry season in mid-October. JEN is currently preparing to build a shelter-type elementary school for the locals in two towns where almost half of their residents have been lost during the last cyclone tsunami. This picture was taken as we were investigating the soil consistency around the area. 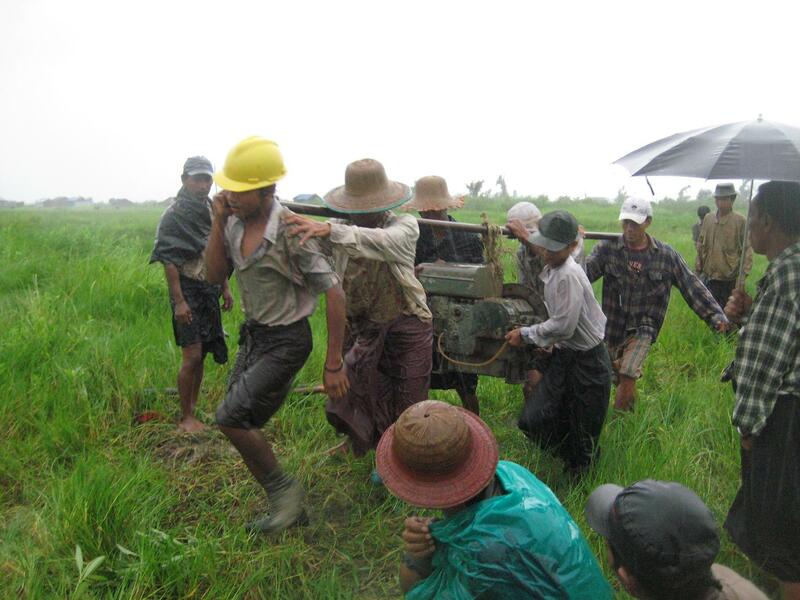 We carried out the investigation based on the cooperation from the local people who worked with us in rain and thunder. Following the construction company’s preliminary opinions, we had initially agreed that we wouldn’t need a foundation post. With further investigation, however, we realized that the ground is extremely soft and that we might need to install metal posts in the soil. 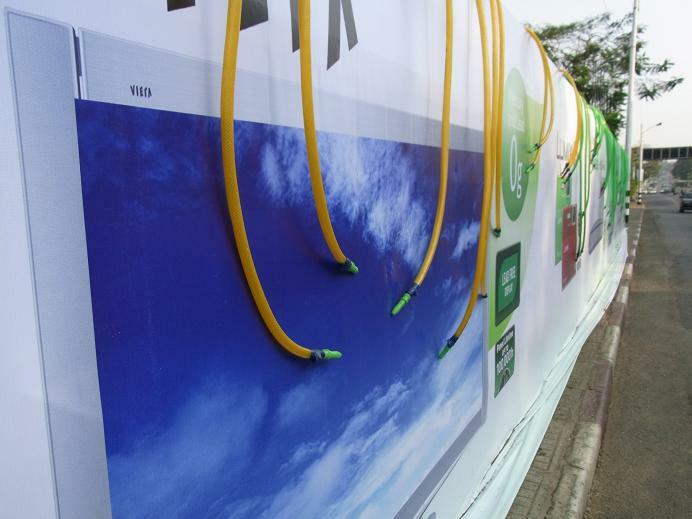 By planting posts in the ground, we would be able to build large buildings even on soft soils. Posts, however, are extremely expensive commodities. We are troubled by such unexpected costs. The villagers also seemed concerned as they observed our investigation until the end in the rain. For the local people, cyclone is an extremely frightening experience, and they claim that what they need right now more than anything is a place where they can escape to at a time of another cyclone. To relieve their apprehension, we are conducting a detailed survey of the construction site, so we can build a strong and rigid cyclone shelter. A crocodile has appeared in the village of Guwechaunji, where JEN is promoting school construction and disaster prevention training. Unfortunately, some domestic pigs were attacked and eaten by this crocodile. This area used to be a habitat of crocodiles; however, since the cyclone, not one had been seen. It seems that they have returned from hiding. 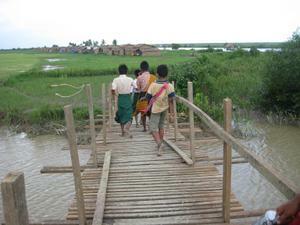 In the neighboring village of Tabochon, JEN and the villagers have worked together to build two bridges These bridges seem to be useful not just in terms of crossing the river during a high tide, but also in terms of protecting children from crocodiles. Nowadays, Myanmar has seen an unprecedented number of tornados that produce some casualities. Villagers’ pain is far from being overcome — while much more time is needed for the recovery from the cyclone, the villagers now also have the crocodiles to worry about. Despite such conditions, villagers’ lives are gradually improving towards secure and independent living, thanks to JEN’s support. Currently, JEN is supporting construction of several small bridges in the villages we have distributed our shelter-kits. In these villages, all the houses were washed away by the cyclone. 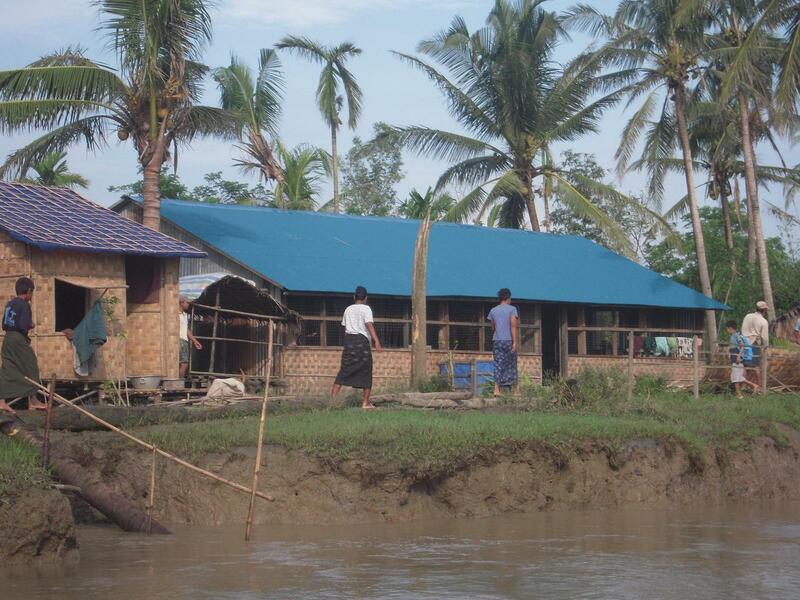 Some afflicted villagers built their new houses at different locations after the cyclone in order to gain more security against similar disasters in the future. Among them, some who did not need to cross the rivers to go to their school or monastery from their previous houses, now need to cross the rivers. 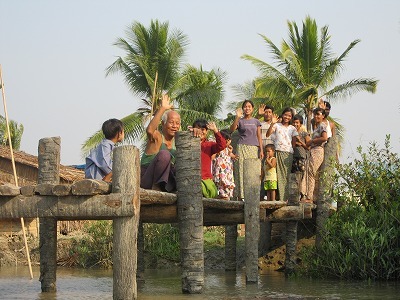 During the dry season, villagers were able to walk across these rivers, since water level is low; however, now during the rainy season, though it is possible to cross the rivers during a low tide, even adults can hardly reach the bottom of the during a high tide. In such a circumstance, children cannot attend school and monks are unable to go to their monastery. 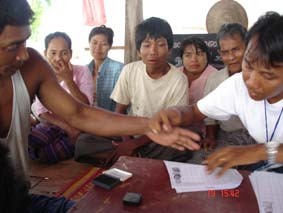 JEN was asked to provide assistance regarding bridges by such villagers. After our survey, JEN realized that rivers are causing barriers to having an ordinary village life. 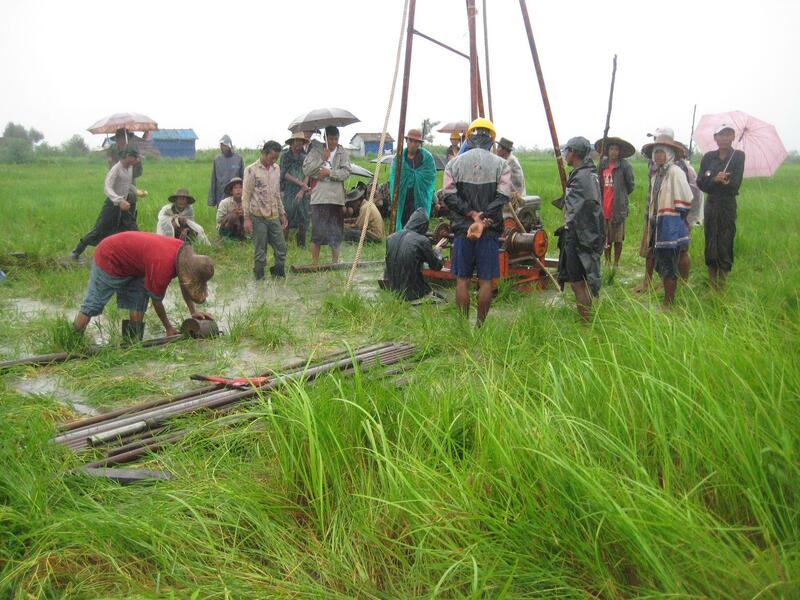 Therefore, on the condition that villagers will build bridges themselves between rice planting labor, JEN is proving materials for these bridges. 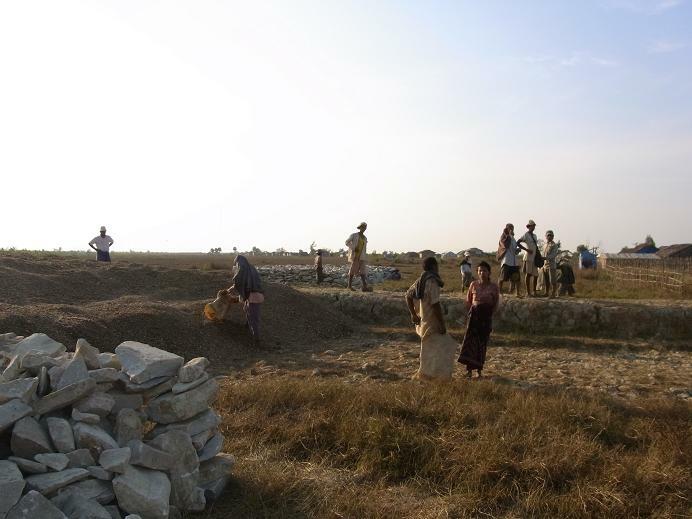 Villagers are very cooperative and construction is ahead of schedule in the village Dabochon, shown in the image. In the beginning, JEN was anxious whether villagers were capable of building such bridges themselves with only a limited number of tools. However, given the current progress, we are now confident that villagers can build them by themselves. JEN is hoping from the bottom of our heart that the bridges will be built soon and all the villagers will be able to attend school and go to monastery safely. 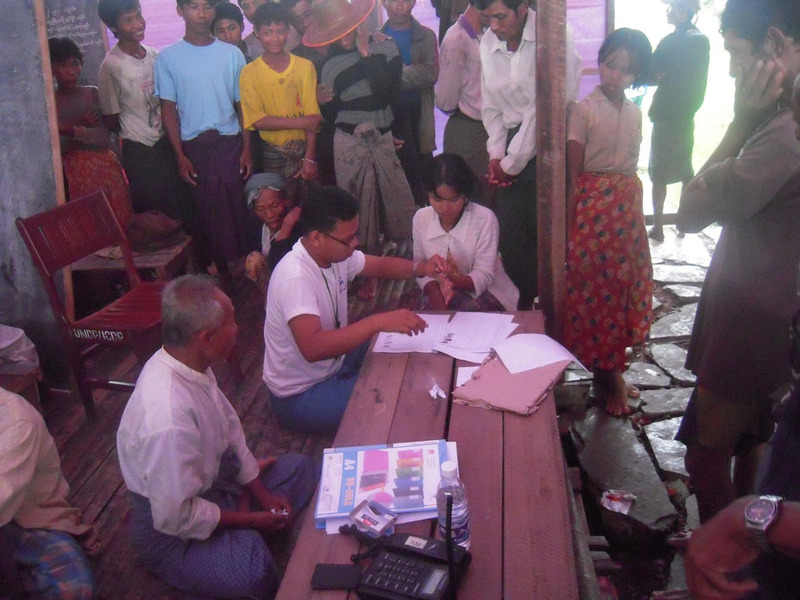 On June 27th, the first case of A/H1N1 influenza in Myanmar was reported. Therefore, the inspections at the airport have become as strict as in Japan. The cost of masks has risen from 10 yen to 40 yen and stocks have been ran out. The only people who wear the mask are those of wealthy people and majority of the people of Myanmar are not able to afford to wear one. The people do not want to wear it from the fear that might caused the rumor that "you are ill", due to the common idea that those who wear a mask are in sick. JEN heard that there are quite a number of housewives who hesitate to wear one for go shopping. This picture is taken at a kindergartens for the wealthy family in Yangon. They have made a decision to wear masks. Although both teachers and children are wearing it, they are laughing at each others’ faces as it is strange to wear it. Some children even cry because they do not want to put it on. Despite the emergency of influenza's outbreak, JEN has come to realize that our planet is linked each other in various ways. Thanks to the kind support from the Japan Platform and JEN's Supporters, JEN has completed the distribution of the shelter kits (a set of parts for a temporary house) to the sufferers whom lost their houses due the gigantic Cyclone. There are at least 50-plus NGOs which either distribute or construct shelters in the disaster area; however, JEN have distributed 4,500 sets —the largest figure amongst them. 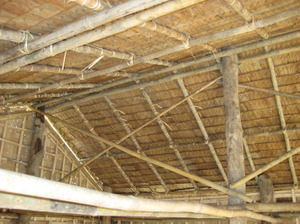 Shelter kits are made from materials which are familiar to villagers, such as bamboo, wood and dani (nypa), so that they can fix and repair them easily by themselves. The size of our shelter, that is 15.7m2, was decided based on the size of the other houses in the villages, number of family members whom survived and the opinions from the villagers. JEN have listened seriously to the villagers voice and have put huge efforts on deciding the size with careful consideration as to not to stress the villagers. In addition, JEN has strengthened the buildings by introducing methods which were new to this area. The first method was a braced frame — a method to connect pillars in x-shape. 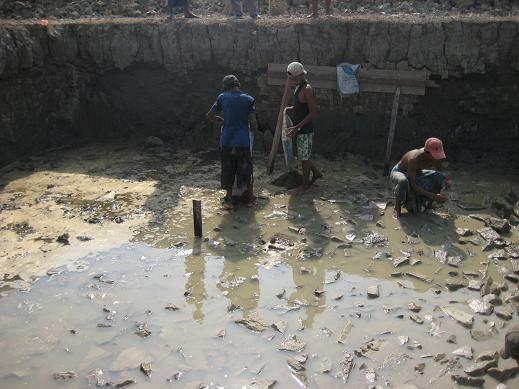 This method was not used in the village, although it can be found in modern cities such as Yangon. Second, the buildings were strengthened significantly by making the walls double-layer and stabilizing the foundations of the pillars with bricks, sands and cement. Our shelters kept steady even during the strong winds and this helped us gain trust from the villagers. Taking this opportunity, JEN would like to thank those that made a donation; JEN could not have carried out the support and aids on a large scale like this without your warm support. However, even though one year has passed, the conditions in the disaster area are not easy. Therefore, we hope for your continuous support in the future. The other day, JEN held the first year anniversary memorial service with the villagers for those who were killed by the cyclone. The monk of the village held the memorial service for the villagers mourning the lost. A lot of women were weeping. It has been a year, but still the pain in their mind remains. The staff from JEN attended the ceremony and were strongly moved. We felt again that the Buddhist faith is very close and precious for the people in Myanmar. After the memorial service, children and adults were eating all together. 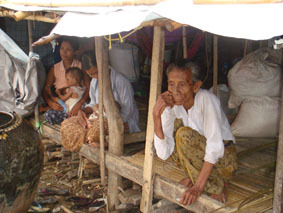 Being busy for the recovery in their daily life, the villagers cannot gather frequently as they did before. However small the assembly can be, we hope that the villagers will recover their ties, little by little. On this occasion, we again sincerely pray for the souls of the lost, killed by the cyclone “Nargis ”. JEN will continue its support hereafter so that the devastated area can recover soon as possible. JEN is surveying in detail in order to decide the distribution site of the shelter kit. The other day, during the needs survey, JEN met four children. The four were brothers who lost their parents and lived with their relatives because of the Cyclone. However, their relatives are out of work and have their own child, so they cannot make a living for the other four children. Generally, children without parents are recommended to go to a foster home run by the government. However, because of the possibility that siblings become separated, the relatives decided to take in the four brothers together. 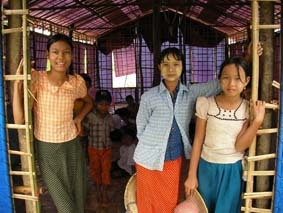 In addition to their own child, it is very difficult to send four children to school. Therefore, there is a chance that the children will stop going to school to work instead. Their life is tough, but they somehow manage to take care of the four orphans. Through the children, we were able to see that Cyclones not only cause physical damage, but influences lifestyles in many other ways. JEN is planning for future programs while proceeding with the present shelter distribution programs. Several days ago, JEN visited the village of Yeywey to monitor our project. Yeywey is located two hours by boat from Lapta. Yeywey encountered the highest wave (ca. 3 m 60 cm) amongst the affected regions. Therefore, the population of the village declined from the pre-Cyclone condition of 1,500 (300 households) to 500 (150 households) including households from neighboring villages. When the Cyclone hit the village, a temple, which had been considered the strongest structure in the village was the first to collapse. The villagers who saw this temple collapse survived by rushing into a two-story school building or the homes of influential villagers, or clung to big trees,. The most well-known story is that of a mother and her baby who survived in a two-story house. JEN was introduced to this mother as soon as we entered the village and was given an opportunity to hear her story. JEN was told that they have rushed into a two-story house to escape from high waves. 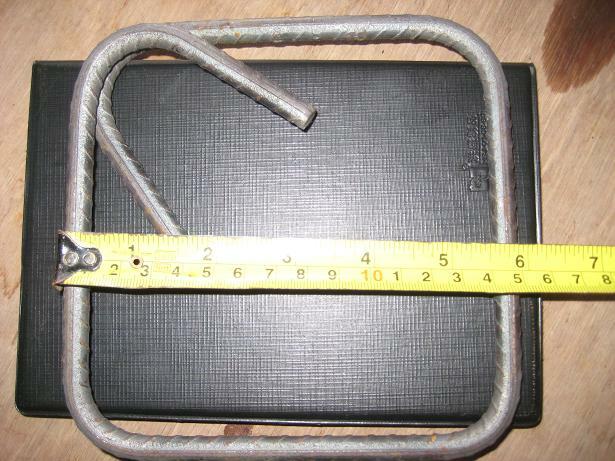 However, they had barely reached the second floor when the roof of the house was blown off (see image). Seconds after this incident, they were hit by high waves. The mother desperately clung to a post of the house with her one arm while she upheld her baby with the other. In this way, they both just barely survived. The devastating power of the Cyclone and high waves can be sensed from this building which still remains as it was. On the other hand, this building is also a place where the members of the village can share the joy of the miracle of survival of this baby. JEN has learned the importance to live through providing aid to villagers and, catalyzed by their strength, continues our activities. 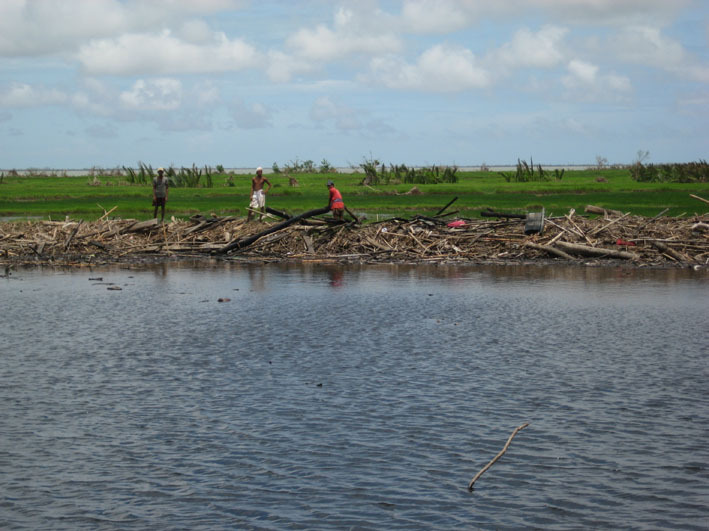 Six Months After The Cyclone: The Need For Psychosocial Care. Presently, JEN is surveying the villages to decide which village to distribute the additional 1500 emergency shelter kits. The other day, when JEN asked the villagers, “What do you need the most?”, the response was “We want our children back”. This villager lost two of their children in the cyclone. In order to provide the support of what they really need, JEN needs to survey and ask various questions to the villagers. However, when JEN encounters this kind of response, there is no way to react other than to be stunned and listen. Six months after the cyclone, even as our activities in Myanmar are getting organized, these kinds of words strike us strongly. We even feel helpless that we are unable to do anything for them to help with this matter. The representatives of the villagers have also lost a lot of family members. The representatives do not show their sadness and are dedicated to assisting the other villagers. Working with such villagers gives JEN the day by day courage to “not stop, just do our best in what we can”. Today, we will explain how shelter kits are distributed to the villagers. First, JEN conducts a needs assessment on the local needs of shelter-kits and determines which villages to distribute the shelter-kits to. After JEN has determined the villages to which our shelter-kits will be distributed, JEN asks those villages to set-up a committee to receive the shelter-kits. Subsequently, JEN asks these committees to compile a list of house owners who will receive the shelter-kits. Members of the committee check the number of shelter-kits upon each arrival. After the shelter-kits have reached the villages, the committee summons all members of the village who will receive the shelter-kits. 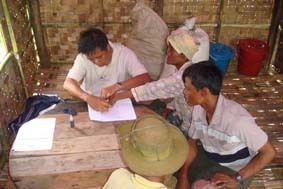 The recipients are asked by a committee member to seal their thumb marks on the document to confirm that the shelter-kits have actually been delivered to them. Villagers exhibit various emotions when giving their thumb marks. Some villagers express their utmost gratitude to donors, while others show empty faces because of the loss of their family members. Some enjoy chatting with others and some become nervous because of their lack of thumb marking experiences. Among them, villagers who showed empty faces comprised a majority of the recipients and JEN are always concerned about them. We are aiming to effectively conduct our support to deliver aid to people who need it most; JEN always take into consideration the necessary supports for those villages with empty faces when leaving the village. When I visit the field, I always stay with the three sisters of the Shunidy family. With them, there is always something to do with "Thanaka", Myanmar’s traditional natural cosmetic product. Thanaka is made from the bark of citrus trees and by grating it with a special stone just for the purpose of making this product. Women and kids are the main users and they enjoy using it as a sunscreen by applying it onto their skin. The history of thanaka is long; it is even carved in a mural decoration which belongs to the Bagan kingdom (AD 1044 -) - the first kingdom in Myanmar. It is said that good old wives had put the thanaka on their face and longed for their husbands’ homecoming. The three sisters taught me how to use it, after they had taken a morning shower. In addition, they advised me to put sandalwood aroma (a grated bark) on my hands and legs, since thanaka itself does not have much of a scent. The three sisters repeat the same procedure after their evening showers. We have a lively conversation while having a light meal together. I'd be probably well adopted in the village with thanaka on me; people treat me like as if I were one of their family members. When we foreigners work in the local field, JEN respects the customs and cultures of the country in various situations, and puts the best effort to blend into the local cultures to construct a better relationship with the local people. In Myanmar, the Buddhist Fire Festival is held at the end of rainy seasons. According to the Buddhist teachings, people and the materials are prohibited from moving from one place to another during the rainy seasons. The best practice for moving is to build a new house during the rainy seasons, and to invite monks to the new house to bring blessings. Fortunately, shelter-kits are expected to be built by the Fire Festival. Villagers say, “We have received the shelter-kits in just the right season.” Since JEN is putting their utmost effort in providing aid with respect to the local cultures, JEN was happy to discover this unexpected coincidence. JEN would like to take this opportunity to thank you for your support to our mission in Myanmar. We hope to receive continuous support from you. You can easily make a donation online. Families who have got a place to live by means of distributed shelter-kits are starting their lives afresh. In a village which JEN visited during the monitoring purposes, JEN was happy to see villagers not only deploying a shelter-kit and living in it, but also organising and customising the interior and exterior of the houses to match their lifestyle. JEN has found an interesting common trend amongst villagers through post-distribution monitoring. 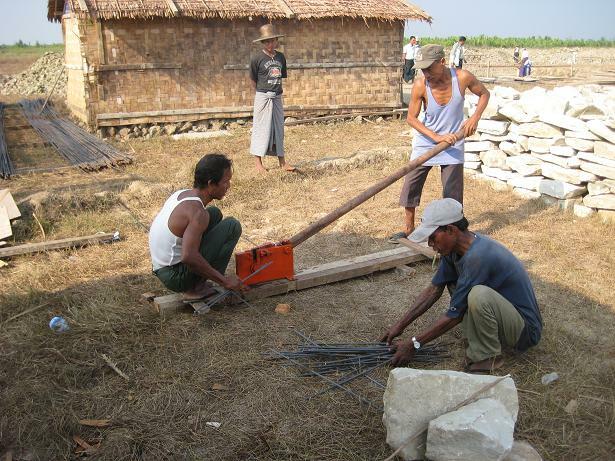 The first thing the people of Myanmar do after they have finished deploying a shelter-kit is making a Buddhist altar. 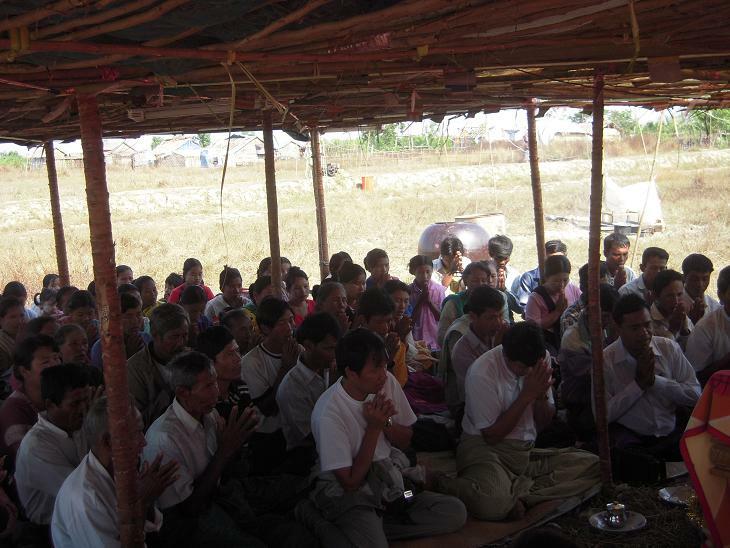 Many people are devout Buddhists in Myanmar. 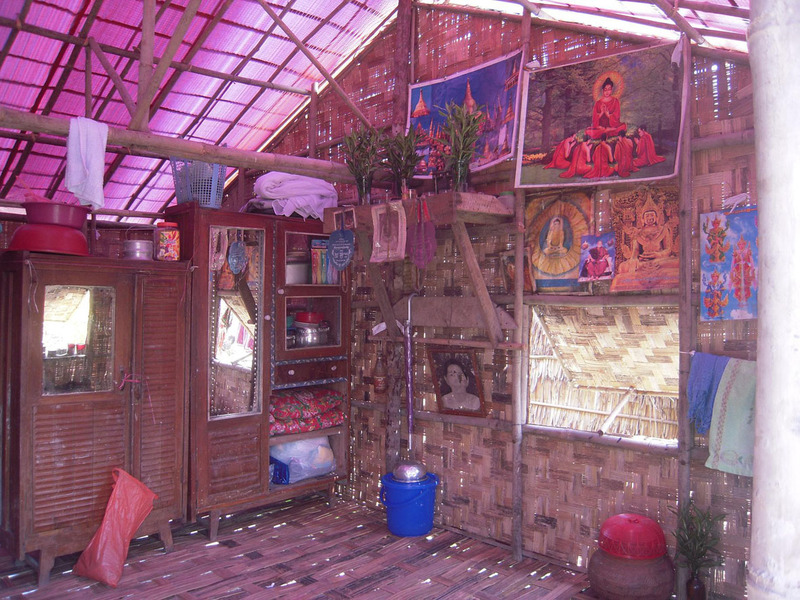 Even though they do not have a lot of belongings, it seems to be very important for them to make a Buddhist alter. In all the houses we have visited, we have found Buddhist altars. 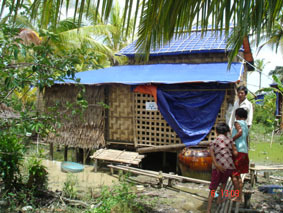 The villagers’ living is recovering to pre-Cyclone standards in the villages in which JEN has distributed shelter-kits. On the other hand, there are still local people suffering from a lack of places to live in villages where JEN has not been able to distribute shelter-kits. To improve such conditions, JEN is planning to continue the distribution of shelter-kits. 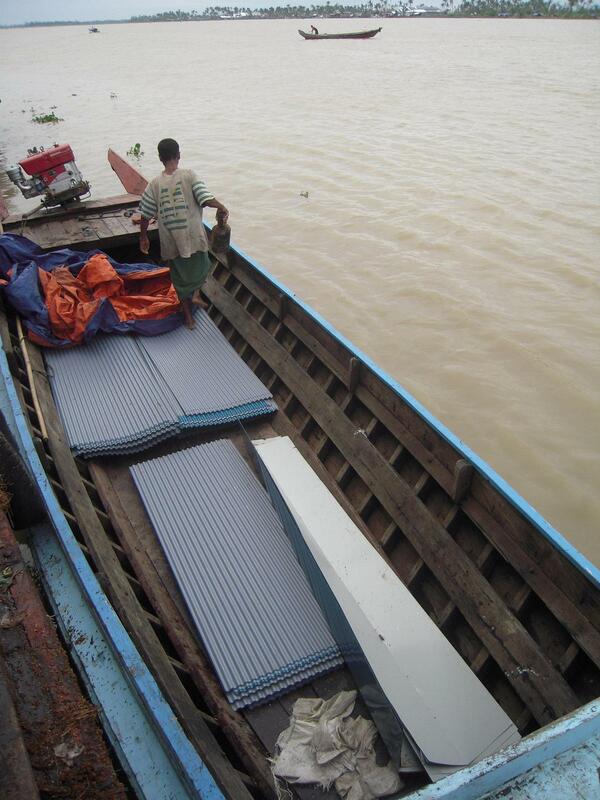 JEN distributes CGI sheets to the schools where their buildings had their roofs blown away by the Cyclone Nargis. “We are happy to see our children under roofs that create an enabling environment to study,” say the teachers. Children also show their happiness and gratitude to JEN by singing songs while JEN visited one of the schools. Some schools that JEN supports with CGI sheets fortunately have kept the framework of their buildings. But many others even got their buildings’ foundations blown away in the Cyclone. They set up temporary small buildings and organize classes both in the morning and in the afternoon separately for children of different grades. Due to these measures, children learn only half of what they have to learn in a day. JEN’s CGI sheets will help them re-establish their school building in the near future. This picture shows the stamp that signifies the receipt for the shelter kits. Distribution of shelter kits for 3,000 households has been successfully completed as planned in the on-going project. 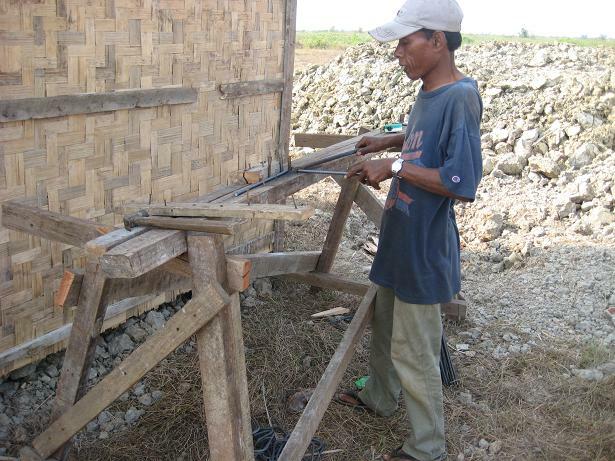 Villagers have made good progress in reconstructing their houses with JEN’s shelter kits. 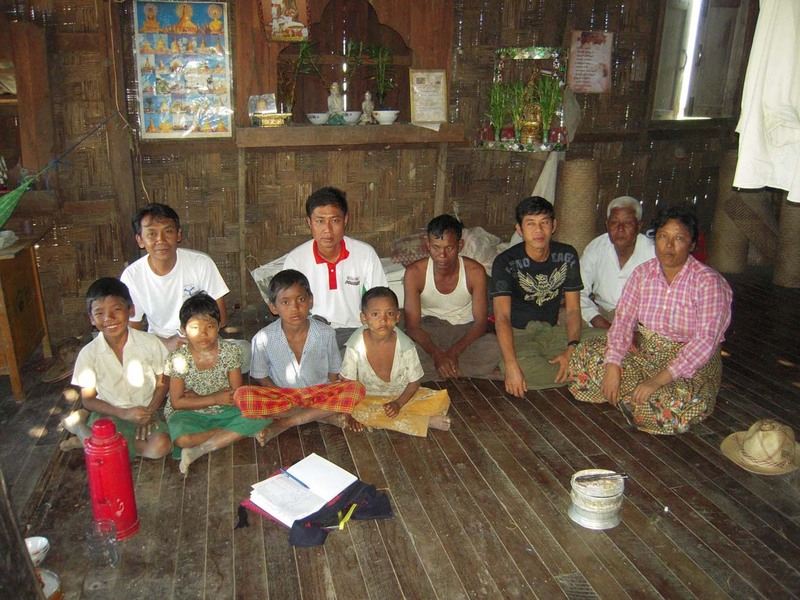 However, in many villages, it is still not rare to see several families living together in a temporary house built with insufficient materials, although it has been nearly five months since the disaster of Cyclone Nargis. The roads to the villages are not in good conditions and material procurement is still a difficult task. But JEN is supporting them in whatever capacity we can to recover their livelihoods and stable lifestyles. We see the smiles and happiness on the faces of the people when they rebuild their houses with the shelter kits. On the other hand, through the communication with the people, we can’t help but think the people have received a big psychological shock by the Cyclone. JEN is now concerned about their mental trauma and will start a needs assessment for psycho-social care support in addition to the on-going project. 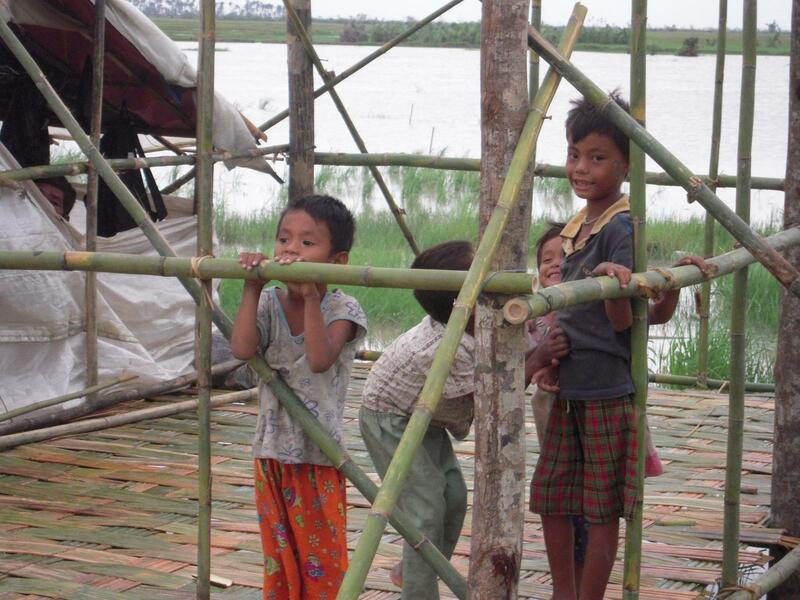 Utilizing shelter kits distributed by JEN, local villagers are working together to build houses. Some villagers seem to be customizing the houses once they are built. For example, a watershoot for collecting rainwater was added to one of the houses. Another house has been expanded by adding a shed right next to it. Customizing the shelter houses according to the individuals’ lifestyles from their own will, is a positive indication of self-sustainable reconstruction of life. JEN is to distribute 3000 shelter-kits by the end of September. At the moment, JEN is investigating on needs for further aid and support whilst distributing shelters. During this needs assessment, JEN asked locals about the Cyclone itself as well. A 38-year-old man visits the site where he lost his four sons and is overcome by anguish every day. A 25-year-old woman who lost ten members of her family burst into tears when JEN asked her about the cyclone, and thus JEN could not continue this interview. A 36-years-old woman told JEN that she could not stop shedding tears during a meal because it reminds her about her late child’s favourite dish. From these interviews, that there were hidden tears behind the everyday smiles of the local people effected by the cyclone. Though JEN was aware of this from the beginning, this was the moment that JEN reaffirmed the severity of the cyclone damage. It is difficult to send aid and support to every village where JEN conducted an investigation. As JEN explained this to the people, they replied, “We understand that it is difficult to distribute aid supplies to every single village. Rather, we are happy that JEN listens to our voice so intently”. JEN recognized the importance of listening to the afflicted people, and JEN is intending to continue providing aid and support by taking careful consideration of the results of this investigation. 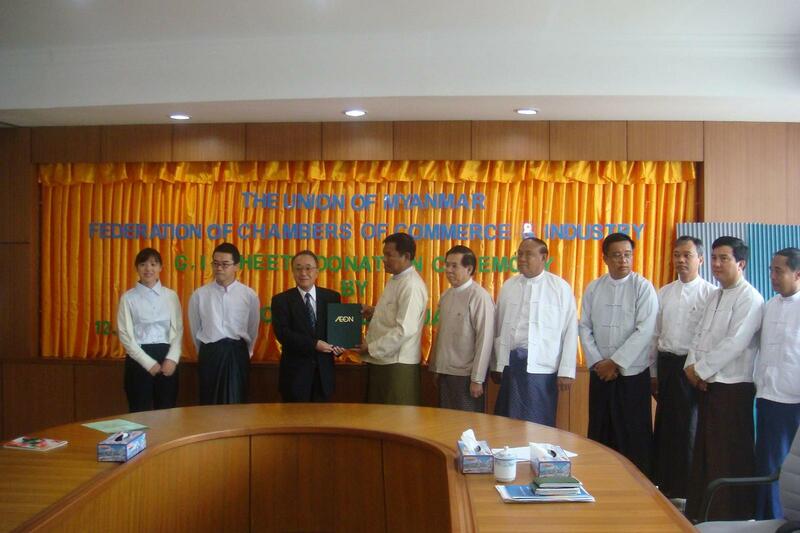 Ten thousand C.G.I sheets contributed from the AEON group were unloaded at the storehouse of the Union of Myanmar Federation of Chambers of Commerce and Industry (UMFCCI) in the Yangon Port on August 6th . JEN organized a hand-over ceremony of the C.G.I. sheets on 12th August in the presence of the President of the Federation, Mr. U Win Myint, and Mr. Yasuaki Nogawa, the Japanese Ambassador to Myanmar. For smooth distribution of the C.G.I. sheets, JEN, with the collaboration of the UMFCCI, is currently conducting a mapping survey on mainly schools. Primary schools in the cyclone affected areas temporarily use tarpaulin sheets for the roofs, or the buildings have remained completely destroyed after the cyclone. Schooling gives children opportunities to meet their friends, and heal their sorrows and fears experienced from the cyclone. Providing the educational space for children is an essential component of psycho-social care for the children. In the areas where road access is poor, there are many locals who are still completely dependant upon aid for livelihoods and there are even locals without a home of their own. 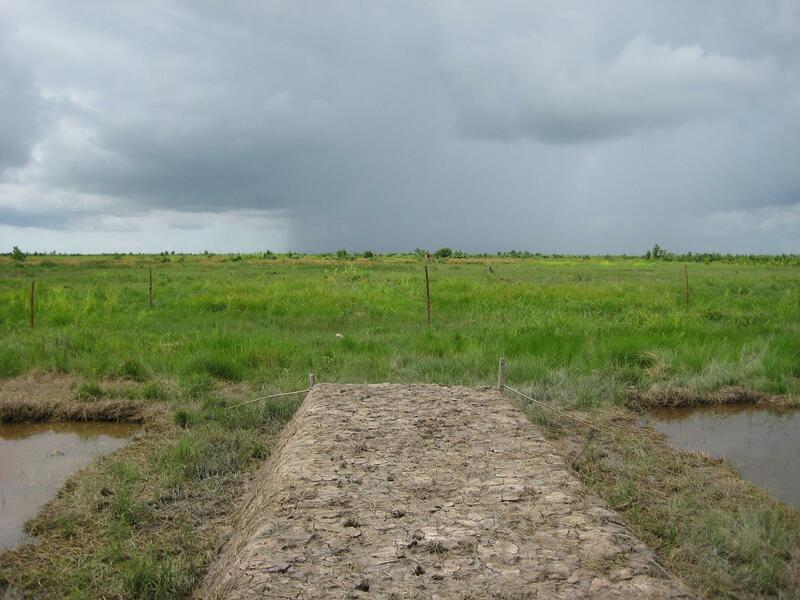 The afflicted area is known for its abundant rice production. 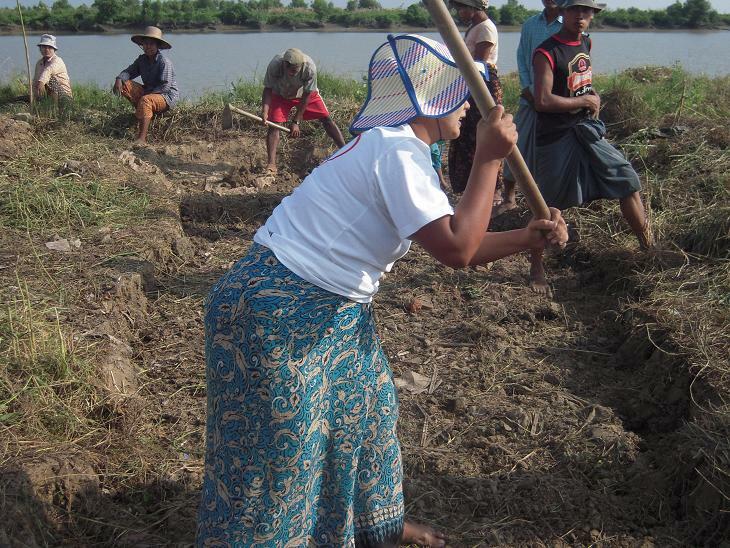 Usually, rice planting is done by mid July and the harvest is in October or November. However, there are fears for this year’s harvest because the rice plants were destroyed by Cyclone Nargis and even those that survived suffer from insufficient growth. If the harvest is short, the local people cannot earn enough income to make their living. Farmers are not the only locals suffering from the disaster; fishermen are faced with a difficult situation as well because their fishing nets and boats were washed away. Furthermore, pond water is undrinkable due to the influx of sea water caused by the high tides. This adds further hardship for the local people. 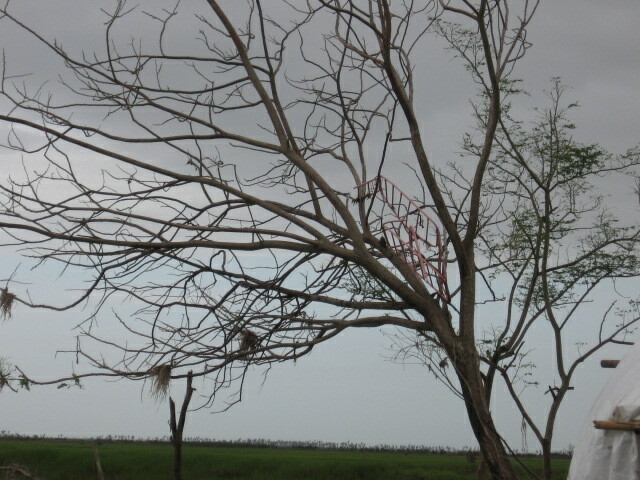 As can be seen, the scar left by the Cyclone, which has killed more than 100,000 people, is deep and serious. Much more time and effort is needed to recover the livelihood of the local people. JEN is considering further support to the afflicted locals whilst paying careful regard to their future perspectives. On the 11th of July, the distribution of the shelter kits began in Leikkyun village in Dedaye. On the day of distribution, all the villagers came to greet and welcome us. Before this day, the villagers had lived in temporary shelters build by debris from the Cyclone, or gone to live with their relatives. However, now, they have come to a stage where they can begin to rebuild their community. The shelter kits that JEN contains building materials enough for one home. After the distribution of material needed to the residents, the building process commence with the aid of a construction company. 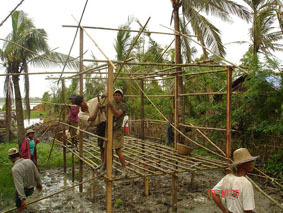 The photograph shows a glimpse of the assembly of a house being built by the locals. With 7 or 8 people, a house can be built within merely a day. The lifetime of these houses can last a good 2-3 years, and with further maintenance it can last even longer. 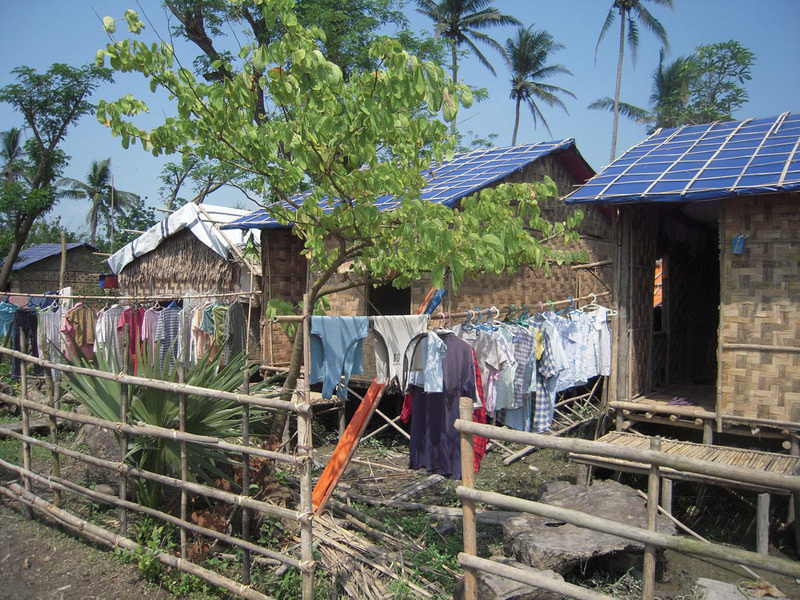 JEN determined the size and materials of these homes by consulting the local construction company to ensure sustainability of homes suit for the natural environment of Myanmar. . The villages expressed with joy that they ‘felt safe in homes that were built with familiar building materials’. We are now looking to gather more supplies and provisions for further development in other villages and regions. We are happy to report that preparations are going smoothly. The cradle on the tree in the picture belongs to a villager; he left it behind after he lost his wife and children in Labutta. ‘I have no will to take that cradle down. I want to leave it as it is’. There are many people in this big village that are now the only remaining member of their family. In their deep traumatic shock, they express their sadness to us. 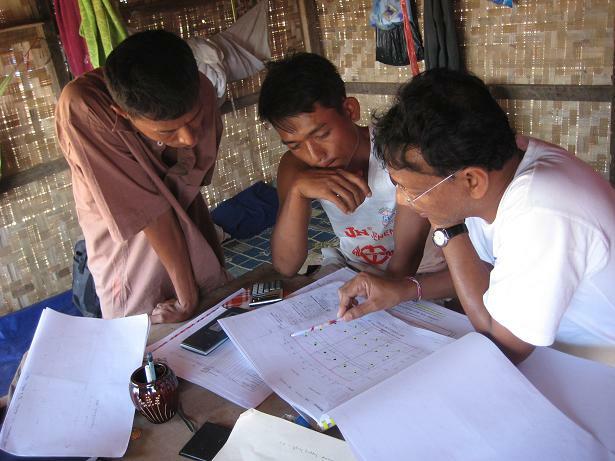 A needs assessment was conducted in a village near the sea, which had been severely damaged by the Cyclone. 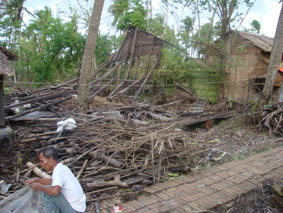 Around 2/3 of the villagers perished due to this cyclone. JEN will distribute shelter kits to villages of this sort. 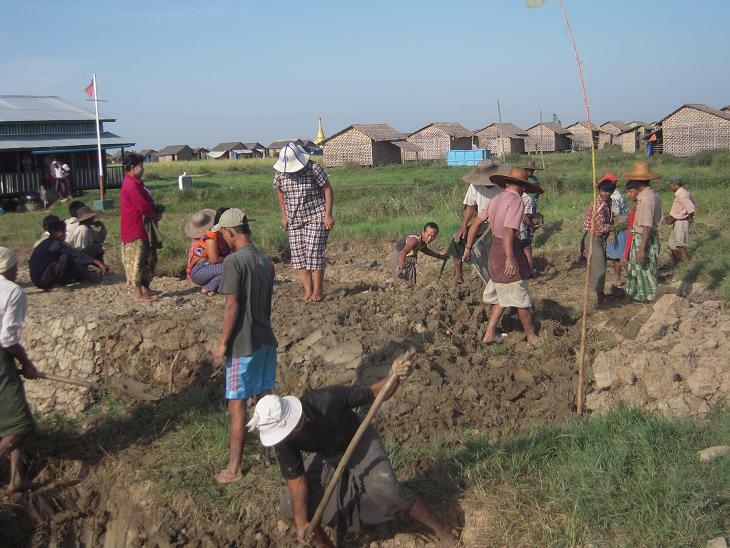 In parts of Myanmar, villagers are cooperating to rebuild their homes. 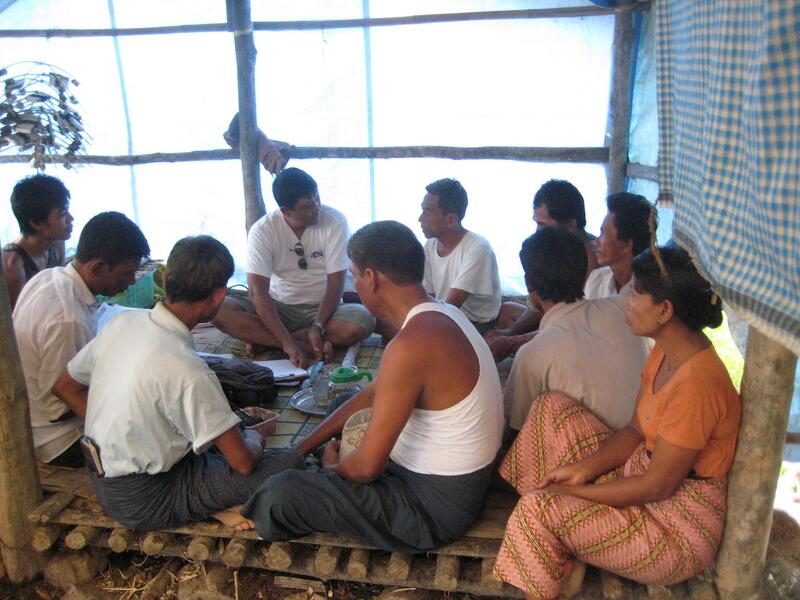 The purpose of shelter kit distribution is to allow the villagers to cooperate in constructing a home. It is important for citizens to come together after a disaster to engage in joint projects. Working collaboratively to rebuild a home will not heal all wounds, but JEN hopes it will lead to some form of psycho-social care, no matter how small. Needs assessments have been conducted in the region of Dedaye and Bogale, where there has been severe damage due to the Cyclone. As a result, it has been decided that shelter kits will be distributed to 380 families in Dedaye, and 460 families in Bogale. 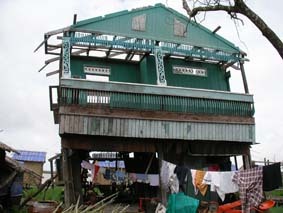 People who have lost their homes have built temporary huts for themselves, or several families are living in homes that were unaffected by the Cyclone. 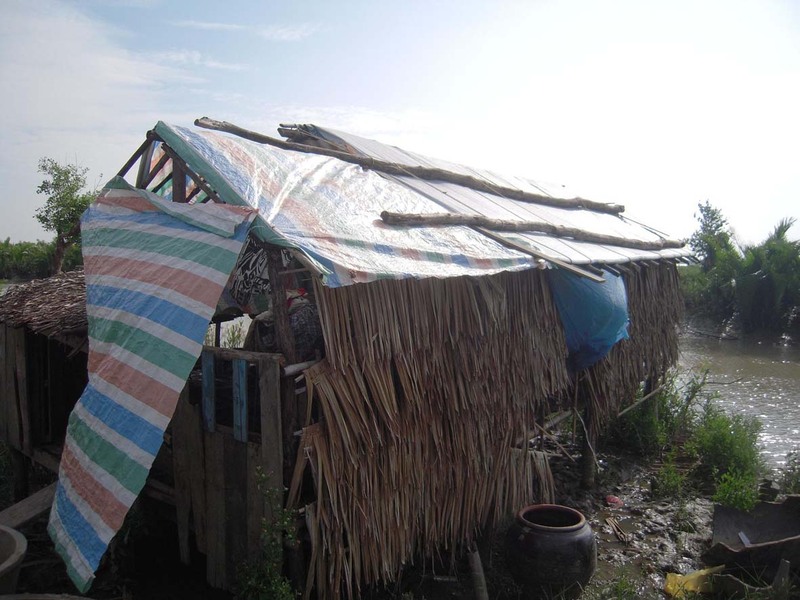 Such temporary huts are vulnerable to strong winds and rain, and the villagers all expressed a desire to live in a safe house as soon as possible. In addition, those who are living with various other families said that, ‘I would like to live in my own family home; I don’t want to cause any inconvenience to other families’. These people are waiting for the shelter kits to be distributed. Needs assessments are still in progress in Lambutta where it has been decided that around 1000 shelter kits will be distributed. The villages along the coast have especially been hard-hit by the Cyclone, and as the needs assessment continues, the need for shelter kits are becoming more apparent. Furthermore, preparation for the shelter kits is under progress in Lambutta. In the target villages, all bamboo, trees, and palm trees have been washed away due to the cyclone, so there is a need for such materials. 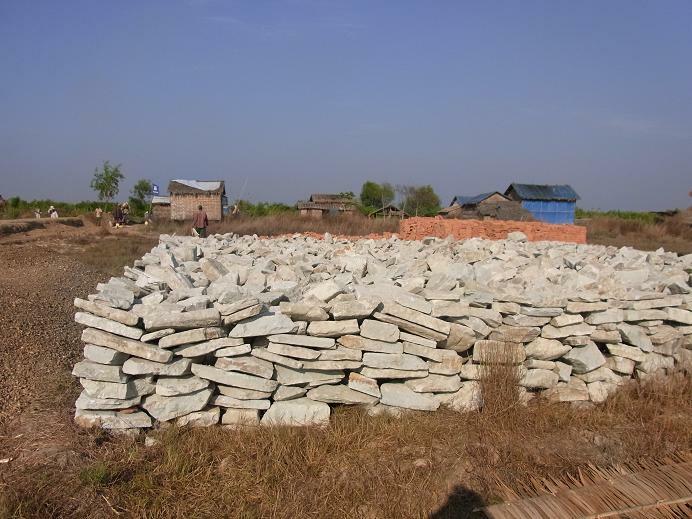 JEN and the Chamber of Commerce and Industry of Myanmar, are planning to bring materials from regions unaffected by the Cyclone and distribute those materials to the target villages. According to the United Nations, there have been more than 100,000 deaths due to the Cyclone. There are many cases where only one member of a family has survived. Such people have lost hope, and are in a state of despair. JEN is contemplating what we can do for people in such situations. The loss of family is something extremely difficult for anybody to endure. JEN hopes that through the distribution of shelter kits, we are able to revive some sense of hope for these people. For example, in Yangon, there are donation boxes throughout the city. Many people of Myanmar have visited the victims and distributed materials and provided donations. It is more than just a spirit of volunteerism; it is a genuine sentiment, people feel that they to help these people," in any way they possibly can..."
Such warm sentiments fill the air in Yangon. Originally, the shelter kit included general relief items such as plastic sheets and tool sets. 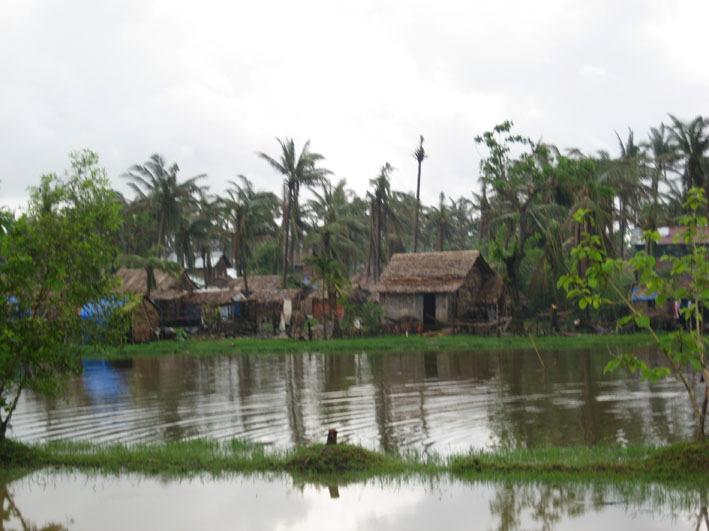 However, upon further needs assessment of the disaster victims, it became clear that plastic sheets were not suitable for Myanmar’s climate, and that people were not accustomed to using them. Therefore, JEN and UMFCCI decided to distribute home-building materials such as bamboo and palm tree leaves in order to better suit the needs of the victims. In emergency assistance, needs change on a daily basis. By providing assistance appropriate for the climate and the people, JEN is able to respect the wishes and requests of the people. Furthermore, distributing materials that the people are accustomed to allows them to reconstruct their homes by themselves. When we shared this distribution plan with those in the village, there was a look of relief on their faces. It is important not only to distribute necessary materials, but to support the people’s positive willingness to move forward. JEN will distribute shelter kits to 1000 households that have lost their homes in Labutta, Ayewardy Division. 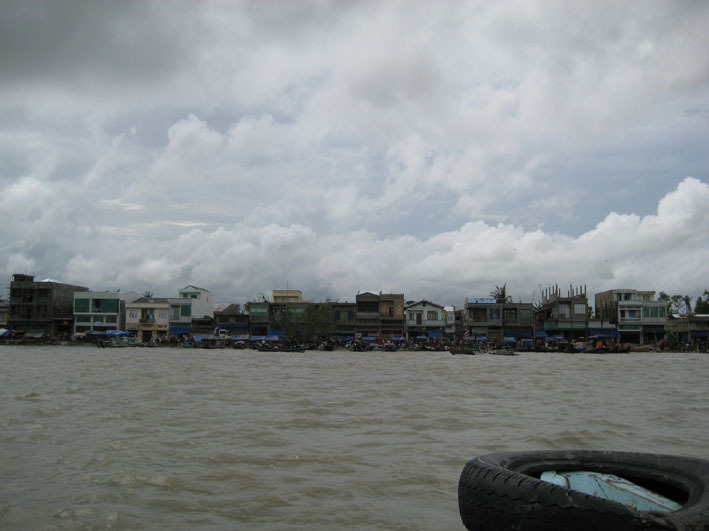 Labutta is a coastal delta area located 10 hours south of Yangon by car. It was one of the most severely affected areas by the Cyclone. The villages that JEN provided assistance to are another 2 to 3 hours outside of Labutta town. Assistance is being provided to many villages situated along the river; however, relief is not being reached in villages along the minor tributaries of the river. JEN will distribute shelter kits to those who await assistance in villages that have not received any form of aid. Many people have lost their homes due to the Cyclone, and without any other option, are currently living in Plastic Sheet tents or refugee camps. JEN, with the support of the Japan Platform, has decided to distribute Shelter Kits to 3,000 families in order for such people to return to a comfortable lifestyle has soon as possible. The areas of distribution will be determined by the deliberations of UMFCCI along with JEN’s local staff members. To provide assistance to victims of Cyclone Nargis, JEN will cooperate with the Union of Myanmar Federation of Chamber of Commerce and Industry (UMFCCI). Most corporations in Myanmar are affiliated with UMFCCI. On June 9th, JEN was successful in reaching an agreement with UMFCCI, and is under the process of initial assessment of needs for the cyclone victims. On June 1st, three NGOs affiliated with the Japan Platform (Peace Winds Japan, Nicco, and JEN) established a shared office in order to provide assistance to victim of Cyclone Nargis. We are currently in the process of conducting Needs Assessments in order to identify the areas that need assistance. Within Yangon, fallen trees have already been removed and the situation remains tranquil. 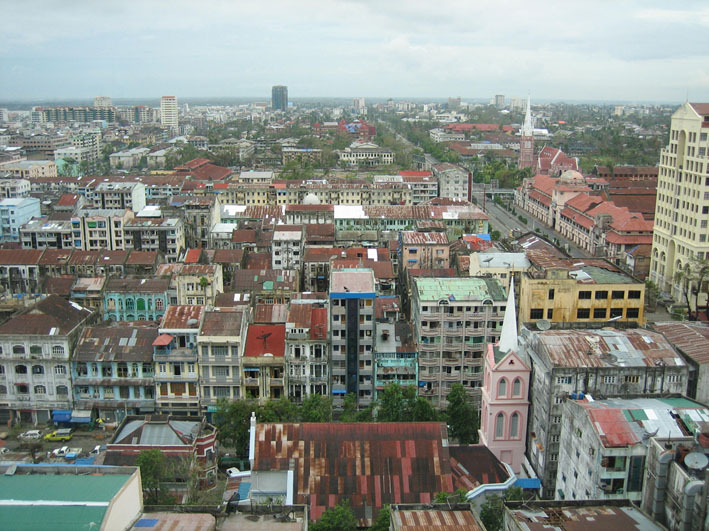 The picture is the view from the office in Yangon.